This month’s “SEO Report Card” victim, er, volunteer, SimpleFamilyLiving.com, is quite simply, an SEO train wreck. The mission of the online business (to provide eco-friendly products that reduce landfill waste) is laudable, but its execution is seriously flawed. Putting aside the fact that our “Conversion Review” columnist would most likely have a field day with this site, I see that pretty much every area of search engine optimization is lacking. From its completely content-less home page, to near content-less secondary level pages, to keyword-stuffed meta tags and title tags, to rampant duplicated content and duplicated title tags, it isn’t hard to figure out why this site doesn’t rank. This is really basic blocking and tackling. Let’s take a closer look and see what needs shoring up. Starting with the home page, there are no category links — nor a single word of text — present on this all-important page. One level deeper in the site, in the “Products” section, is where you’ll find the categories. At least those category links are text, and that’s a relief. I’d really like to see that left-hand category on the products page moved up to the home page. The category pages don’t fare much better. They are devoid of copy other than link text, which isn’t very effective at conveying a keyword theme on the page on which it is contained. At least the product pages offer the spiders some text (the product description). But there are no heading tags (such as H1 or H2) to be found. Heading tags are missing on both the category and product pages. http://www.simplefamilyliving.com/products.asp?catid=98&cat=45&mode=, which are both contained on the Laundry category page. Duplication exists within tags on pages, too. The same title tag and meta tags are employed across a number of pages, confusing Google into thinking those pages are probably duplicates of each other — even though many of them contain different page content. Curiously, some contain no content at all (such as http://www.simplefamilyliving.com/products.asp?pid=4&cat=6&mode=open). The spiders should not be allowed to access these, yet I did find them in Google’s index (they probably live in the Supplemental index). The site may be tripping a spam penalty as well. For one thing, some of the title tags are keyword-stuffed, such as: “Simple Family Living natural, organic and fair trade items for infants, babies, children, women and men handmade and socially and environmentally responsible items” (23 words). Some of the meta keywords tags are stuffed with too many keywords as well. This is pointless, since meta keywords don’t help rankings. It would probably be best to just remove them all from the site altogether. The meta description is a list of keywords instead of human-readable sentences or phrases. This looks spammy, and it’s a no-no in terms of click-through effectiveness from the search engine results pages, too. Heading over to the SEOmoz Linkscape tool, I discover how poor the domain diversity and anchor text diversity really is. 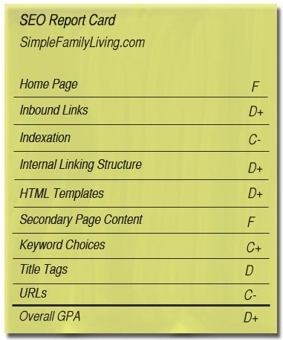 Linkscape found only 21 domains linking to SimpleFamilyLiving.com. Of those 21, none incorporated important keywords in the anchor text (such as “green products,” “eco friendly products,” or “eco products”). Pretty much the only anchor text Linkscape found was the company name. Given the eco-conscious nature of SimpleFamilyLiving.com, it should be easy to garner links from similarly inclined bloggers. It’s nice that the Dailyecotips.com, Worstedwitch.com, and Pristineplanet.com blogs are linked to SimpleFamilyLiving.com; now it just needs 100 times more sites to do the same. Otherwise, Simple Family Living won’t stand a chance to rank for anything other than their company name and a few esoteric, non-competitive search terms. Request an SEO site grade by emailing seo.report@practicalecommerce.com.